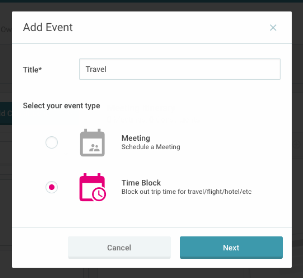 To create an event, click "Create event" in the upper-right corner of the Trip's Meeting itinerary section or use the Actions drop-down menu. Enter the Title of your event and select the event type - Meeting or Time Block. When creating a new meeting, you'll be required to enter a meeting title, time, and location. Note, time is restricted to the days of the trip. Setting the meeting location will set the time zone. You can add constituents (by name), additional solicitors, and description text to your meeting. Only fellow EverTrue users marked as solicitors can be added as "Additional Solicitors." Lastly, is this meeting an anchor visit? Select yes to mark it as such - it'll receive a star! Hit save to see the meeting added to your itinerary at the correct date and time. Edit or delete your meetings at any time by clicking on the meeting you wish to adjust. Drag & Drop - Additionally, constituents have been added to your trip, you'll be able to create new meetings by dragging and dropping their card to your itinerary. 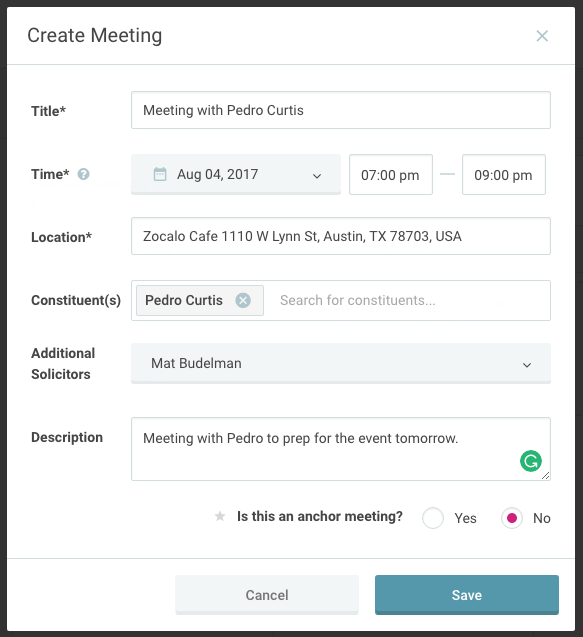 After the constituent has been "dropped" into your itinerary, you'll be prompted to add meeting details. 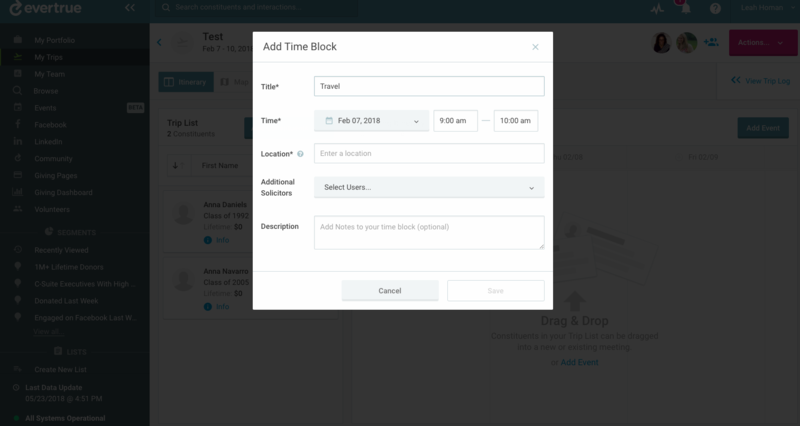 When creating a time block, you'll be required to enter a title, time, and location. Note, time is restricted to the days of the trip. Setting the meeting location will set the time zone. You can also add in additional solicitors and a description if you have it! 4. Hit save to see the Time Block appear on your trip. Time Blocks will appear greyed out while Meetings will have a solid white background. Questions? Reach out to genius@evertrue.com!